Helopeltis bugs | Infonet Biovision Home. 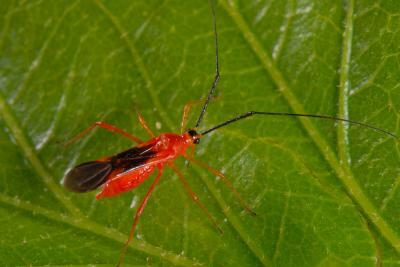 The cocoa mosquito (Helopeltis schoutedeni) also known as Helopeltis bug or mirid bugs are slender, delicate insects, about 7- 10 mm long with long legs and antennae, the antenna being nearly twice as long as the body. The females are red and the males brown to yellowish red. They lay eggs inserted into the soft tissue near the tips of flowering or vegetative shoots. 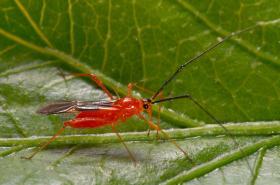 Nymphs (immature bugs) are yellowish in colour. Both adults and nymphs feed on young leaves, young vegetative and flowering shoots, and developing fruits. 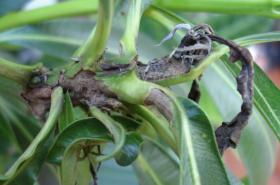 Typical feeding damage of Helopeltis species appears as a discoloured, necrotic (blackened) area or lesion around the affected plant tissue. 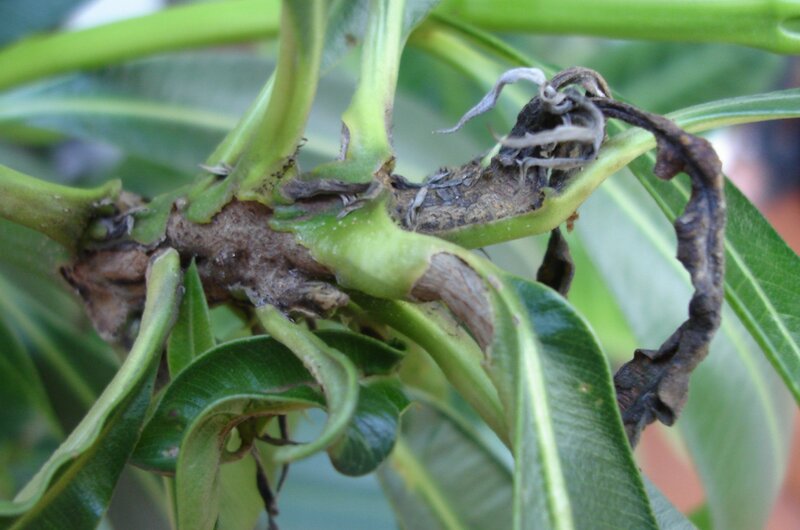 Heavy infestations by Helopeltis species can result in pod malformations and premature drop, thus providing a venue for secondary infection by microorganisms and serving to attract other pests to cacao. Monitor the crop regularly. Helopeltis attack occurs very suddenly and great vigilance is very important to control this pest, particularly during the rainy season or when water is available leading to flushing (production of young shoots) when Helopeltis populations normally build up. Conserve natural enemies. Weaver ants build nests on cashew trees providing good protection against this and other bug pests. Do not interplant cocoa with crops that are host for Helopeltis bugs, such as cashew, tea, sweet potato, guava, cotton and mango. Cultural practices including pruning, weeding and shading schemes have been used in the control of cocoa-mosquito.